Andy H: Here at the PCG we have often asked the question "What ever happened to 'that' comic we were promised?" 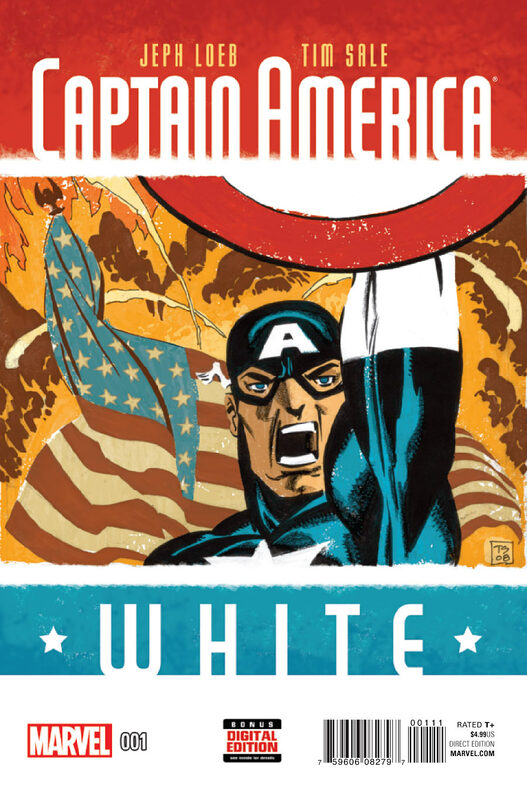 Well, we finally have the answer to one of those missing series as the long awaited Captain America: White #1 finally lumbers into view. I hadn't realised just how long we had been waiting, so I checked. Issue #0 hit the shelves in 2008! Yikes! That's some delay. But good things are always worth holding out for and with the creative duo of Jeph Loeb and Tim Sale on the book I'm just happy to know it is finally on it's way. Here Cap recalls a mission from World War 2 which features Bucky and the Howling Commandos. 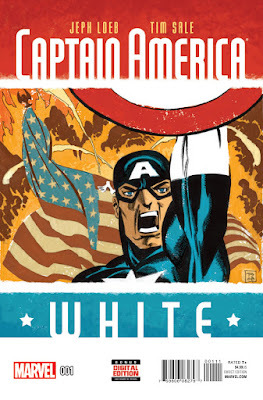 Haven't read Captain America: White #0? Don't worry, it's reprinted in the pages of this oversized issue (probably a good thing even for those who already own it). Continuing the theme of talented creative teams, Tokyo Ghost #1 is right up there. Rick Remender has a few hits under his belt (to say the least) and is currently writing one of my fav reads, Deadly Class. Then we have artist extraordinaire Sean Murphy, who's born to draw this sort of stuff. Set in the nearish future and humanity is addicted to technology (sounds about right!). There's only one place left free and that's the Garden Nation of Tokyo. What a cracking concept - really looking forward to this one. This week we also have the annual release of Simpsons' Treehouse Of Horror. Much like the TV show, I tend to dip in and out of the Simpsons comic but Treehouse is always a little treat. We reach the end of the first story arc in Squarriors #4. This has been a brutal and bloody book and not the kind of thing you would normally expect of talking squirrels and assorted woodland creatures. What would Walt Disney think? Terrific art all the way through. Manifest Destiny has been a solid read since issue #1 and continues to rank highly on my pull-list, and finally All New Hawkeye #5 concludes my reading for the week. Stewart R: It's very much about endings and beginnings this week! Up first will be Death Vigil #8, the concluding chapter to Stjepan Sejic's superb and engrossing supernatural epic which seems to be headed to something of a heartbreaking finale if my gut serves me well here. He's created clear battle lines between 'good and evil', thrown some interesting players into the mix who bridge those sides, and imbued Death Vigil with a palpable sense of drama. Be a little sad to see it reach its end. Then there's also the conclusion to the first arc of Kickstarted Devil's Due series, Squarriors, which, if I'm honest, has not set the world alight as I expected when I saw the initial preview art way back in the day. The near photo realism of each mammalian character has made it difficult to differentiate and identify each squirrel as the story has unfolded and with such a breadth of cast, and uneven release schedule to boot, this has not been the easiest first arc to follow. Then, with the endings out of the way, the new beginnings roll in! High up the list is The Paybacks #1 from Donny Cates and Geoff Shaw who both worked on the terrific Dark Horse miniseries Buzzkill back in 2013. This time their focus on superheroics falls upon the cost and debt involved in becoming a superhero and maintaining the lifestyle, and the idea of a team of bankrupted supers chasing up debts from their peers and foes sounds like a very promising premise to me!